When we went to Thailand for 6 months and when we went to Spain/Europe for 3 months, we took 4 suitcases and 4 carry-ons along. That was it. 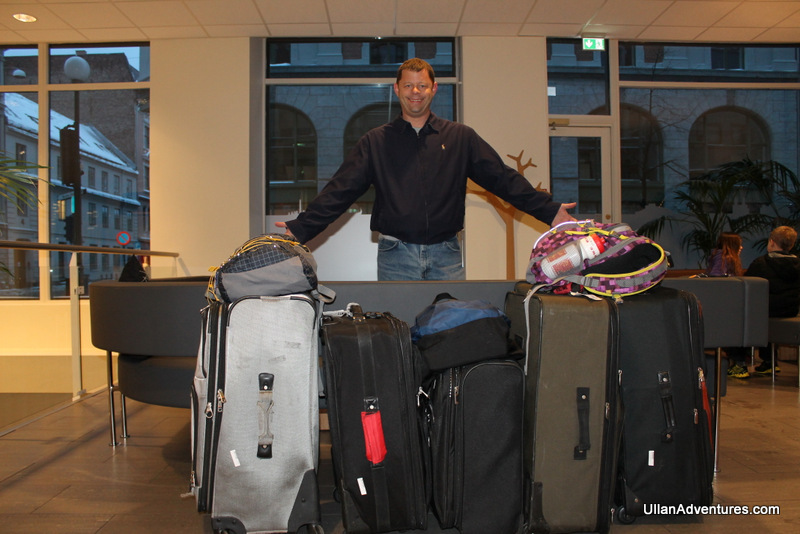 Basically we each had 1 suitcase to hold all our essentials for many months. After our time in Spain, we shipped a box back to the US and traveled with 3 suitcases. Mostly the winter items were shipped back as well as a few things we weren’t using. I’ll cover what we took to Spain as what we took to Thailand was essentially the same minus the winter clothes. Two (2) Laptops. One is for Chuck’s work and one is our home computer. These are our essential items! iPad mini. We just bought this a year ago and its been invaluable for each of us. We use this for email, looking things up, reading, games for the kids, great to take on road trips so we can connect to WiFi and look things up/check maps/etc. DSLR. I’m loving my new Canon Rebel T3i. I have 2 filters for it as well. Kir’s iPod and Bose headphones. I will not, can not travel without these. I need about 5 things when I travel and this is 1 of those top 5! Two (2) 110v-220v Travel Power Strips. These have come in handy because we can use an adapter to plug it into a wall then plug in 3 of our electronics at once. It has surge protection as well and works in the US and abroad. Wireless mini speaker. This is a new purchase for our Spain trip and made because I really missed being able to listen music without headphones and the speaker on my laptop doesn’t get very loud. We can use it with either laptop, the iPod, iPad and more. Headphones with a mic for calls via the laptop. External hard drive. Nice to backup the laptops and have in case a laptop dies while on the road. Chuck’s cell phone. Even though we don’t use it abroad, its nice to have in case we need it and for when we get back to the States. International Driver’s License for each adult. They were starting to fine foreigners in Thailand that didn’t have one and I’ve heard they’re necessary for Spain as well. For $15 each, its nice to err on the side of caution. And no, you don’t have to be a member of AAA to get one. Chase credit cards. Our United Chase and Chase Sapphire cards have been awesome to have. Not only do we get a large frequent flyer mile bonus, but there are no foreign transaction fees. PADI Dive card. I plan to dive so its best to keep this with me! Homeschool curriculum books: What Your 2nd Grader Needs to Know and What Your 3rd Grader Needs to Know. Complete Curriculum: Grade 2 and Complete Curriculum: Grade 3. These are proving to be great workbooks for English and Math as well as tests. Some basic school supplies such as crayons, pencils, pens, scissors, etc. I bought all of these in Thailand and then brought the stash with me to Spain. Stuffed animals. Each kid brought quite a few. Beckett’s fuzzy (i.e. blanket). He gets cold like his mama so he needs a blanket so we bring his from home. Other kid toys: each kid gets to pick a few packable, small toys to bring on each trip. Each one usually brings a couple of books as well. Razor for Kir plus razor blade replacements. Electric toothbrush for Chuck with replacement heads. Glide Floss. Not taking my chances we can find this stuff when we arrive and anything else gets stuck in my teeth. Enough toiletries for a week or two while we’re getting set up: shampoo, conditioner, toothpaste, sunscreen, etc. Basic medicines: Acetaminophen, Ibuprofen, Dramamine for the kids, Ibuprofen for the kids, Nyquil (if I’m sick, I need this stuff! ), etc. Basic healthcare items: nail clipper, brush, hair pic, hair brush, etc. Make up basics. And I mean basics such as a few lip glosses/sticks, 1 packet of eye shadow and not much else. Not sure why I bother since I pretty much haven’t worn makeup in 3 years! Shoes. Each of us brought 3 pairs of shoes: 1 pair of sneakers, 1 pair of flip flops and 1 pair of casual shoes. That’s it. Swim suit including a rash guard and swim goggles for each of us. Shirts (long and short sleeved). PJs for the kids and I. 1 sort of nice outfit for Chuck and I in case we want to go out. Heat safe spatula. It’s so nice to have at least 1 spatula in the kitchen. Travel books. For Thailand, we had 1 travel book. For Spain, we actually brought 4 as two books were for all of Europe and we still had a lot of planning to do.